AaaAa Jas slushnav deka vo momentot koga Snapple cudovisteto se srusilo, Rageangel se nasla ispod, i momentalno se naogja na rehabilitacija vo New Yorskata bolnica. Like Icarus flying too close to the sun, a giant Snapple kiwi-strawberry pop couldn't take the heat. 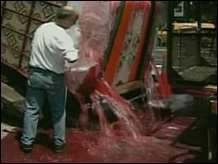 NEW YORK (CNN/Money) - The world's largest ice pop had a brief moment in the sun Tuesday. But the dream of beverage company Snapple and its partners quickly melted away when the enormous frozen pop turned into slush and spilled onto the streets of New York City. Snapple was trying to beat the 10-ton mark for world's largest ice pop, set in 1997 in the Netherlands, said Lauren Radcliffe, a spokeswoman for the company. The area was closed off because the substance was sticky, Radcliffe said, and the Fire Department had to hose down the street after the incident. The kiwi-strawberry bar was about 35,000 pounds, well above the roughly 20,000 pounds of the existing record-holder, Radcliffe said. But a representative of Guinness World Records said the sculpture needed to be free-standing in order to qualify. " We couldn't deem it worthy, as it were," said Stuart Claxton, the Guinness representative. "Maybe we should have done it on New Year's Eve," Radcliffe said. OooOo Samo shto zboruvav so micko i mi reche da vi prenesam vaka: Ako Snapple-ot ne e so vkus na limon ili lubenica voopshto ne sakal da pravi muabet. micko vij vaka...ja sum spremen za lizenje i ako treba i zivotot kje go dadam .. samo dali si ti spremna za da te lizam? јузер научен е мицко кал под нокти да лижи... исто како кога пасе трева земја ус пат што голта. научен е мицко кал под нокти да лижи... исто како кога пасе трева земја ус пат што голта. micko dalila ti neshto mnogu mi se sramis i nekjes da odgovaras na privatni poraki/prashanja. ama ko za tebe ako e lizenje u prashanje kje te stavam prva na spisok .. rage kje poceka. јузер i Pana e na proporcionalna lista za lizenje.